The Venezuelan National Guard blocks off a bridge on the Colombia–Venezuela border with a tanker truck. 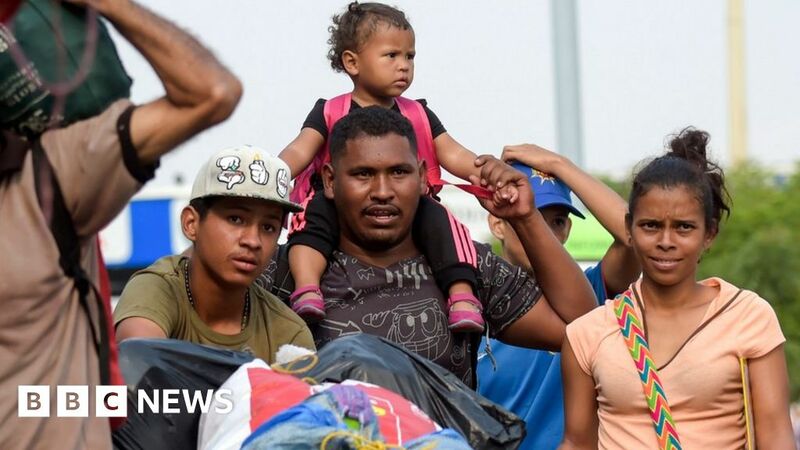 The Venezuelan opposition had been planning to use the bridge to bring humanitarian aid into the country, while President Nicolás Maduro has rejected foreign aid, saying "we're not a nation of beggars". 2019-02-23 Sixty Venezuelan National Guard personnel defect to Colombia; three of them defect after smashing a barrier at the Simón Bolívar International Bridge on the Colombia–Venezuela border in two armored vehicles, leaving some injured. A video posted on social media shows the men with their guns above their heads in a sign of surrender. 2019-02-21 Venezuelan President Nicolás Maduro orders the closing of his country's border with Brazil. International humanitarian aid is currently scheduled to enter Venezuela on February 23, under foreign military protection. 2019-02-20 The Venezuelan Navy closes its maritime borders with the Dutch Caribbean islands of Aruba, Curaçao and Bonaire ahead of the planned entry of international humanitarian aid into Venezuela on February 23, which Nicolás Maduro considers a precursor to invasion.